There’s a lot of work when it comes to buying ‘baby stuff’ before your little one arrives. One essential item will be your baby’s bath tub, since this will be a special time for baby and parents to bond, get social, have fun and even play. In our quest for a tub, we went with The First Years Infant to Toddler Tub. 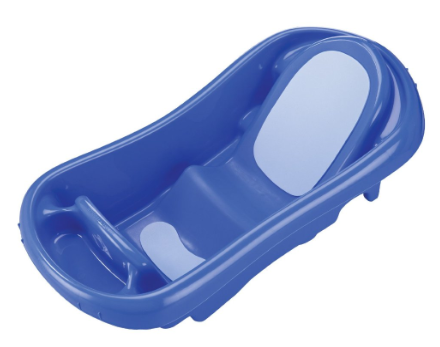 This blue tub has one side with a reclined back for babies and a steeper side for toddlers. It comes with a sling to support newborns, which we actually only used once since it didn’t attach very well to the tub. The tub is made to fit single and double sinks or just rest on your counter. The padded infant recline is nice to keep baby in place and there’s a little seat that will keep your little one in place very well. There’s a nice storage area to keep a small wash cloth, soap, toys or whatever you need during bath time. The tub also has a drain plug to easily drain water—and it also acts as an alert when water is too hot (we don’t rely on this though, as we test water temperature ourselves). Overall, this is a decent starter tub (that won’t break the bank) for your baby which will also bring you extended usage as it grows with your little one. You can check out The First Years Infant to Toddler Tub here from Amazon.ca or Amazon.com.